Queen's University Belfast have developed a leadership programme for students who volunteer for Green Impact, to help them to gain the skills, knowledge and attributes to become future environmental leaders. 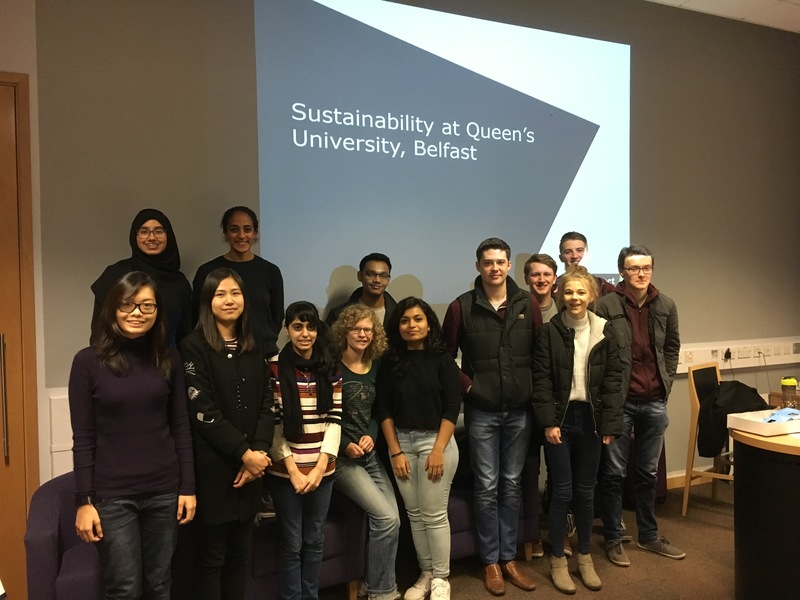 Queen's University Belfast have been taking part in Green Impact since 2011 and the student involvement has always been a key part to the success of the programme. Each year students volunteered to be Green Impact Project Assistants, working within departments alongside staff teams to support their teams into achieving an award. In 2016, the university decided to create a programme which was more structured and offered the students a formalised volunteering programme, accredited by the university. The Environmental Leadership Programme, gives students a clear path to engage with the University whist driving positive environmental change. The students need to complete 70 hours of volunteering which includes helping organise Recycling Week, Green Week and attend workshops facilitated by the university and NUS. The course is 'degree plus' accredited meaning each student who completed the programme, will have Environmental Leadership included on their degree certificate. By joining the Environmental Leadership programme students can gain practical experience in environmental management, whilst playing a key role in helping the University achieve its low carbon vision. They will also develop their skills in project management, teamwork and communication; and will be well placed to become a future environmental champion in their chosen field. Through the Environmental Leadership programme students will gain valuable practical experience in environmental management and sustainability. One of the students who completed the programme in 2017, Shing Him Mak spoke about his experience in his blog, which you can read here. The programme has gone from strength to strength as this year over 30 students have signed up to take part in the programme, up from 12 in it's first year! You can listen to Sara Lynch, Environmental Manager and Rachel Vaughan, Graduate Intern, talking about the programme in our Green Impact webinar here. If you would like to showcase any innovations you've made to Green Impact in our webinars, please contact katie.jepson@nus.org.uk.